In the past years the average number of Web-enabled devices owned by each user has significantly increased. Liquid Web applications enable users to take advantage of all their devices sequentially to migrate their running applications across them or simultaneously when running different views of the same application at the same time on each device. 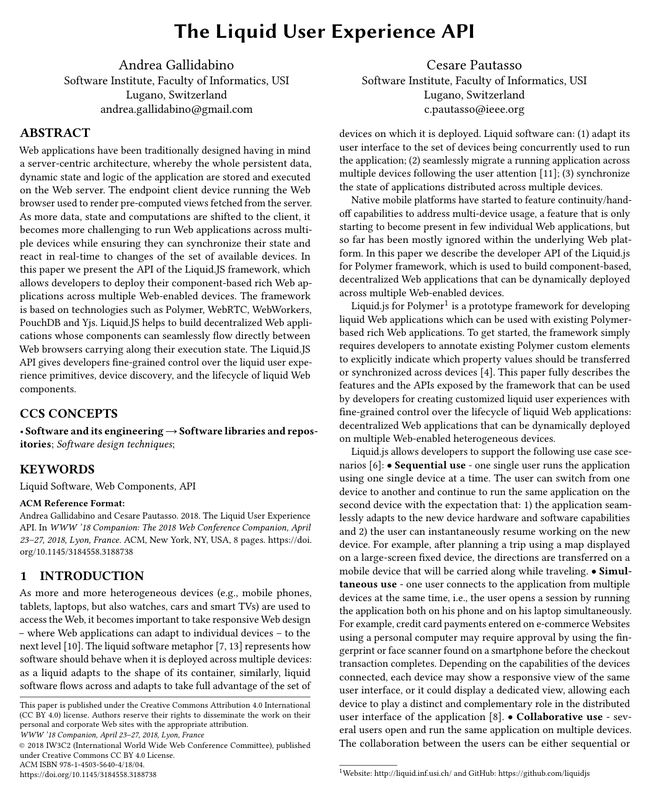 Developers of liquid Web application need to control how to expose the liquid behavior of their cross-device Web applications to the users. To do so, they can use the API of Liquid.js we describe in this paper. Liquid.js is a framework for building component-based rich Web applications which run across multiple Web-enabled devices. The framework is based on technologies such as Polymer, WebRTC, WebWorkers, PouchDB and Yjs. Liquid.js helps to build decentralized Web applications whose components can seamlessly flow directly between Web browsers carrying along their execution state. The Liquid.js API gives developers fine-grained control over the liquid user experience primitives, device discovery, and the lifecycle of liquid Web components.